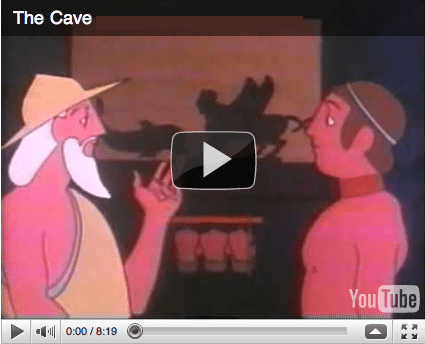 Plato’s parable of The Cave, both the actual story and this video directed by Sam Weiss, tells the eternal story of the human condition: the mainstream masses are lost in darkness, and one individual leaving it behind to cross the axis-mundi, see the truth and bring it back to his tribe. The story seems to have two target audiences, with the beginning acting as an illustration to the blind exactly how their world is constructed and in the end, a moral call to action for those who have been “illuminated” t0 share their knowledge with their fellow man. To convey this, both the story and the video make heavy use of astrological and occult symbolism, Greek myth (especially the tale of Prometheus) and the symbols of the collective unconscious (such as shadows and darkness being associated with ignorance and light and the sun being associated with truth). You might also watch this video and see Plato’s influence on The Matrix, and even Joseph Campbell’s famous Hero’s Journey. Let’s break down some of the elements in this video and interpret it through the lens of Seeing Through Saturn. The cave is our Saturnine reality and Plato is saying that the world we live in is a construct designed to keep us enchained and in the dark. When he is set free, our hero journeys outside the cave to find the true light of the sun, and experiences the natural world as designed by God. Able to finally See, he comes to understand the true order of the universe, learning that from the sun comes all. In Plato’s allegory, the sun is synonymous with the creator and also the Truth, and our hero becomes someone who lives in illumination of that truth while the rest of his people live in the darkness of the cave. A journey complete, he tries to return to his people only to find that he can no longer live as they do. He is ridiculed and cast out of the society. Plato’s story ends with the call to action that those who have seen the light, and been illuminated, go back and try to share the Truth with their people, and to bring them into the light as well. These shadows the prisoners watch projected on the wall is the symbol of the all the meaningless trivia that takes so much time from our lives. To reference Buddhism, the shadows are the elements of Maya (illusion) that keep us distracted from the truth. Be it shopping, or the entertainment industry, or compulsive relationships, those shadows may entertain, but ultimately just dim one’s view of the truth. It should be pointed out that the illustrator in this video chose to have one of the puppets that has entranced the masses be Capricorn the Sea Goat. In astrology, Capricorn is the archetype of the public figure, be it a politician or a pop star, someone who stands in the public eye, delivers a message (good or bad) and is listened too. In a way, Plato predicted the rise and power of mass media when he chose to use this metaphor of the shadow puppet show. It’s interesting that Plato does not choose to explore who these men are that have constructed the cave, and control the puppets whose shadows have the prisoners so hypnotized. Plato does not even bother to explore what their agenda is or what these men have to gain by keeping those people in a cave. That he postulated this while living in ancient Greece, where society was much less complicated than it is now, suggests that this worldly condition of the masses being kept in the dark by an in-control minority is one of the innate spiritual conditions of being alive and a human. Failing to explore this is perhaps a wise thing, as the act of keeping track of the conspiracy of the cave and the agendas of the men who built it might be akin to following the patterns of the shadows projected onto the wall. In the same way the prisoners of the cave are distracted by learning the patterns and trivia associated with the shadows, the illuminated run the risk of being distracted by uncovering the identity of the people who control the cave and understanding what their agenda is. By omitting these details from his parable, Plato is saying that the architects of the cave and the world within it are not important. Nothing matters but getting out of the cave.